You can create specific keyboard shortcut in Microsoft Windows 7 to run any application, program or software under Microsoft Windows 7. Here is a small tutorial on how to create such shortcut. We will show you with the example of Adobe Photoshop CS4 Extended. 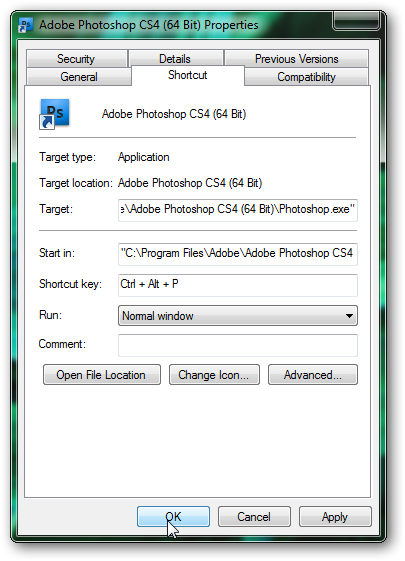 Click start, type the name of the program, in our example, we will type “Photoshop” (Without the quotation marks) ; then right click over the name of the program and click properties. Click OK. Close the dialog box. Now you can launch Adobe Photoshop by pressing CTRL + ALT + P from the keyboard. 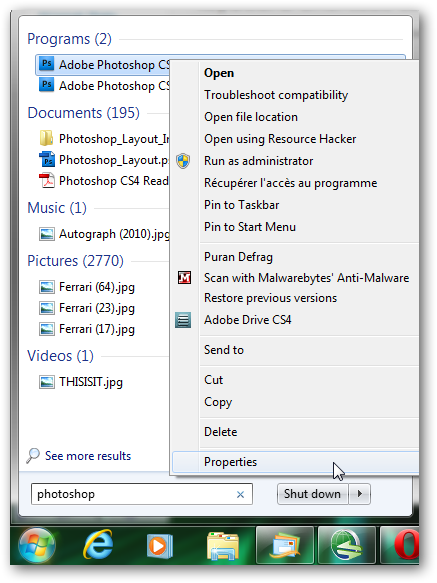 In this way, you can create keyboard shortcut for any program in Windows 7 . This Article Has Been Shared 9111 Times! You may need to force users of the computer not to install new gadgets in Windows 7. Here is the tutorial on how to disallow installation of new gadgets in Windows 7 other than from Administrator account. Thank you very much for your comment. Keep visiting thecustomizewindows.com . This is my first time visit at The Customize Windows. I found so many fascinating stuff in your discussion board particularly its discussion. From the tons of comments, I guess I’m not the one one having all of the enjoyment here! sustain the good work. Cite this article as: Abhishek Ghosh, "Keyboard shortcut to run any application or program with Windows 7," in The Customize Windows, December 15, 2010, April 24, 2019, https://thecustomizewindows.com/2010/12/keyboard-shortcut-to-run-any-application-or-program-with-windows-7/.